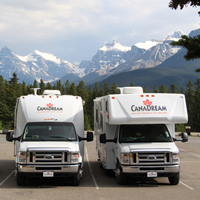 As the owner of a 1975 class C Chevy motorhome converted into a food truck and an RVer in her personal life, Jody Barned offers some interesting food for thought. A Red Seal chef, Barned worked odd jobs in kitchens before becoming the executive chef at Calgary’s Palomino Smokehouse in 2005. “That’s where I got my passion for Southern barbecue,” said Barned, who is nicknamed the Barbecue Queen. “They took me on a trip to Tennessee to do research. Part of it is the Southern flavour—and by flavour I don’t just mean the flavour of the food, I mean the whole lifestyle of the Southern food,” she said. Barned opened the Palomino and worked there until 2008. She considered a career change, but discovered that she was meant to be in the food industry. “It’s what I love; it’s my passion,” she said. Most mobile food vendors operate from converted step van-style trucks. Barned’s vehicle is a bit more of a challenge. It’s an old class C motorhome that has been gutted and rebuilt or “MacGyvered,” but she thinks that gives it character. Barned was on the road in her Chariot of Smoke on June 5, 2011—the first true food truck to take to Calgary’s climatically challenging streets—serving up specialties smoked “slow and low” on a blend of cherry and hickory wood: melt-in-your-mouth pulled pork shoulder sandwiches, beef brisket, homemade coleslaw, cowboy beans, corn fritters, and a Canadian dish with a southern twist—poutine with pulled pork, beef brisket and bacon gravy. “When it’s been good it’s been really good and I’m getting great business” she said. “But when it’s bad my water tank is freezing and exploding, like it did this past winter. While Barned does not own an RV for recreational use, she said her boyfriend does and that one day she would also like to have her own. “I love the lifestyle,” she said. 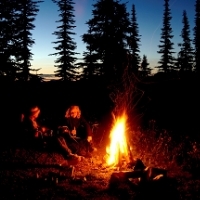 “I love camping and I love being in the outdoors. For more information on JoJo’s BBQ, visit bbqcalgary.com. 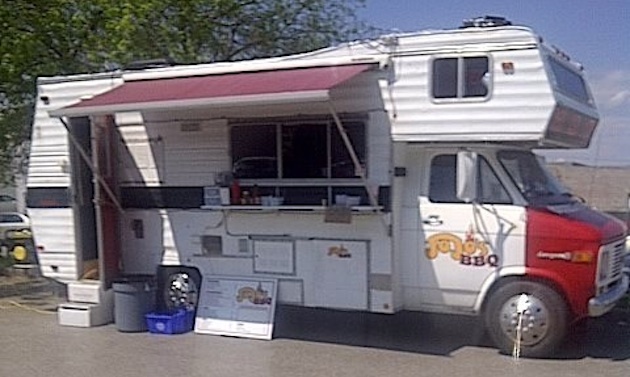 To find when and where JoJo’s BBQ and all other Calgary-based food trucks will be, visit streetfoodapp.com/calgary. Pull husk back from each cob only enough to remove silk. Wrap each cob from top to bottom with bacon slices. Replace husks around bacon-wrapped-cob and wrap each ear in aluminum foil. Place in outer embers of your campfire or on a grill, turning occasionally, for about 15 minutes. Carefully remove aluminum foil and remove husks. Bacon will not be crispy. Place un-husked cob back on the grill to finish cooking bacon or remove bacon, cook it up and eat separately. Season corn with butter, seasoning and maple syrup. 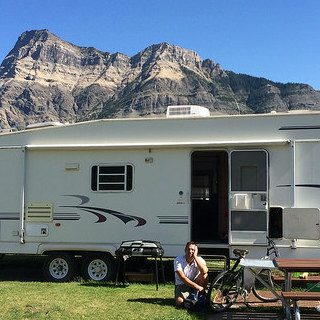 The Sonnenberg family fell in love with RVing during their first summer in their rig. With the heat wave of summer, BC Wildfire Management says extra precautions need to be taken in keeping campfires safe and regulated.